Nestled in mature secluded grounds. The first impression of Kowhai Lodge is one of seclusion and privacy. The relaxed ambience and green bush surroundings invite a complete change of pace. Re-energize your well being and health in a setting where you can relax away from stress and get back to nature. Welcome to a superbly appointed luxury self-catered holiday home. Nestled in mature secluded grounds, the house sits just a 200m flat walk from Kowharewa Bay beach on the beautiful Tutukaka Coast, gateway to the famous Poor Knights Islands. Kowhai Lodge contains all modern conveniences, including a spa pool (Jacuzzi), petanque and lawn croquet grounds, bar-b-que and outdoor furniture, and is maintained to a high standard by the owners all the year round. Indoors, the spacious open plan living, including modern kitchen, allows excellent indoor/outdoor flow to two north facing, yet sheltered decks. Excellent diving, fishing, watersports, and safe swimming are available, and guests have the complimentary use of kayaks, fishing rods and golf clubs. Close by are shops, restaurants and beauty spa facilities, as well as charter facilities for fishing, diving and day trips to the Poor Knights. The local golf course is ten minutes away in Ngunguru, or players can enjoy 18 hole golf at four other well appointed courses in Whangarei. The Lodge is fully equipped and furnished, and owners are close at hand to assist you and make your stay as comfortable as possible, and can provide you with wealth of local knowledge. Kowhai Lodge is ideally placed for guests to access local activities and amenities, yet providing gusts with seclusion and privacy in a peaceful, relaxing environment. It was the sense of tranquility that attracted us to the property 20 years ago, and we have developed both the house and the extensive grounds to enhance this. As soon as we entered the driveway in 1997 we said 'this is it. This is where we want to live', and these sentiments have been echoed by guests over the years. Kowhai Lodge is now highly regarded and has a NZ Tourism/Qualmark accreditation of 4 stars plus, and a Silver award for Environmental sustainability. We are also Hospitality Award holders in the Bookabach 'Bach of the Year' awards. We love living on the Tutukaka Coast which has so much to offer, and, which, is very highly regarded for it's natural scenic beauty by such publications as National Geographic Magazine. It truly is a place to enjoy. Friendly, welcoming, informative owners onsite to assist you as you require. When you stay at Kowhai Lodge you will be in touch with what makes New Zealand a globally sought after destination: scenic beauty, easy access to activities and amenities, and a clean, uncluttered and unpolluted environment. On location we provide spacious, private grounds that have been developed to accommodate great indoor and outdoor living. 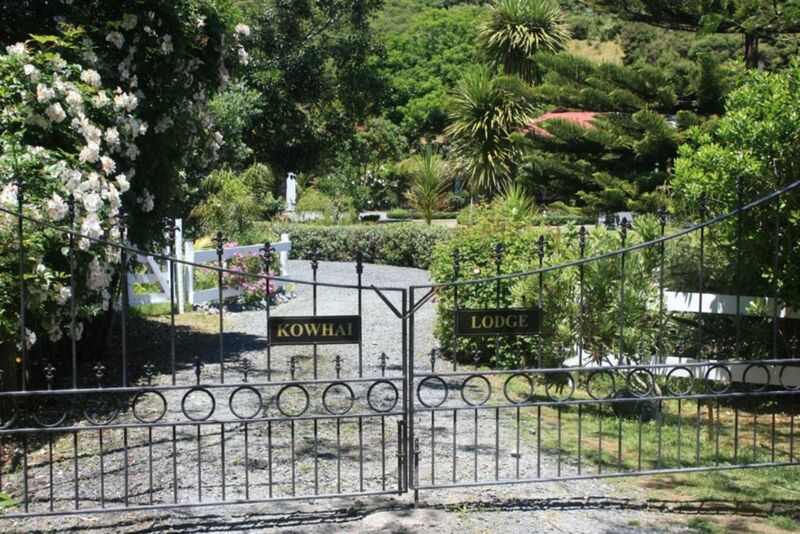 We regard the feeling of space and peace as a primary attraction of Kowhai Lodge, and we love sharing our property with our guests: it's a feeling of rest and relaxation that greets you as you enter the grounds. Your hosts, Lyn and Dave live close by and are readily accessible 24 hours a day. 200 metres from beautiful Kowharewa Bay: safe at all tides and ideal for kayaking or paddleboarding for use by guests at Kowhai Lodge. Close by some of the most scenic beaches and coastline. Set in a secluded native bush surrounded setting, and extensive grounds, ensuring privacy, yet close to beach (200 metres) and local amenities: the best of both worlds. Close to Tutukaka; gateway to the Poor Knights Islands, which offers shopping, bars and restaurants to delight. Further afield (25 kms.) the city of Whangarei offers travelers extensive shopping. As well as the fire, the Lodge is equipped with two heat pump inverters. In addition there are heaters available I each bedroom. The refrigerator is large and has a freezer unit underneath. The stove is a four element ceramic cooktop at bench level, with a extractor hood above. Coffee can be made either using the De Longhi espresso machine (not capsules but ground coffee), or one of the plungers available. All coffee is provided and there is a grinder and milk frother. Condiments and spices are provided, as are cooking oils and a range of coffees and teas (including herbal). Milk, butter and sugars are also provided. Everything is provided: cutlery, dishes, glasses, and all cooking utensils sufficient to meet the needs of all our guests. These utensils include a wok and bar-b-que tools. The modern and well equipped kitchen contains everything needed to make cooking a pleasure. Extensive lawn with croquet set up and plenty of space for outdoor games. Great for families. A perfect spot for a relaxing few days with the family in the midst of travel. Lyn & David made sure we had everything we needed, and it was lovely getting to know them. Lots to do at the house, and we all enjoyed the croquet on the front lawn. Wonderful family group who were very communicative and interactive. We enjoyed meeting them and getting to know them, and would welcome them back anytime in the future. They left the property in immaculate order, and that was very much appreciated. Very highly recommended to any future host. Very positive experience. A fabulous stay with brilliant hosts! A wonderful home with lots of toys for adults! SUP, kayaks, croquet etc. everything you can possibly need! Thanks to Lyn and Dave. They were fabulous! We really enjoyed having you stay with us, and with the open, friendly communication. You were superb guests and welcome back anytime. We really appreciated the way the property was left in such immaculate condition. It is very rewarding for us to hear families enjoying themselves, and utilising the the amenities. That makes what we do so worthwhile. Thank you. The photos really speak to the quality of the home and the joy of the surrounding area however it is the hosts who make it an incredible experience. Warm, delightfully lovely, accommodating and respectful. They made us feel so welcome when they showed us around and really went the extra mile to make us feel at home. Very special holiday home. Really idyllic. Second time here after a three gap and as good as we remembered. Lyn and Dave are great hosts and the property is immaculate and in a such a beautiful setting. I dare anyone not to love this house. A beautifully restored gem tucked away in immaculate private grounds. There is a great beach at the end of the driveway and some of the most beautiful beaches in New Zealand within a few minutes drive. Beautiful and welcoming home in a stunning location. The setting and surrounds were delightful. The home is very well set out with everything you would need. Kowhai Lodge is located on the northern side of Tutukaka Bay on the Tutukaka Coast, an area noted for its scenic beauty (National Geographic Magazine). Tutukaka is also gateway to the famed Poor Knights Islands known to be one of the best sub-tropical dive areas in the world, and the home of Riko Riko, the largest sea cave in the world. Boats leave Tutukaka Marina to take tourists diving, snorkeling and paddleboarding, or for eco-tourism trips throughout the year. Further afield, Whangarei, Northland's capital offers tourists a wide range of shopping and restaurant experiences, and will, soon, be the home of the Hundertwasser Museum and Maori cultural/arts centre. Also available in Whangarei are authentic Maori experiences through Maori tourism initiatives. Tutukaka is also an excellent hub from which to travel further in Northland. Close by are excellent beaches and areas of scenic beauty, and the Bay of Islands and the Waitangi Treaty grounds are an easy round day-trip away.